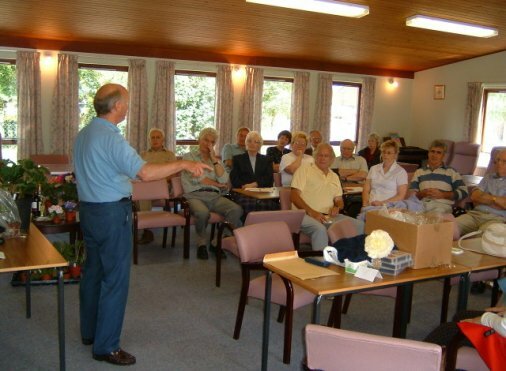 The East Anglian Area has been in existence now since 1988 formally being the Peterborough Begonia Group. John Taylor is the area representative taking over from Dave Staines. 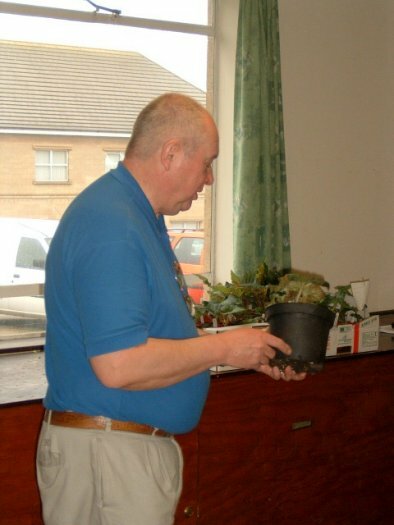 John became the representative in Autumn 1993, he has been growing begonias for over 30 years mainly double tuberous and rexes he also enjoys designing and erecting stands of begonias with a different theme each year mainly in aid of charities. The area is run by a group of enthusiastic members one of whom was the late Roy Mackey who was a well known character and an enthusiastic grower of cut blooms. Roy is greatly missed as he was known as the man who can. If any member wanted something in the begonia world they would ring up Roy and if Roy hadn’t got it he invariably knew someone who had. He was a man with an enquiring brain and loved nothing better than experimenting with composts etc. to better our begonias. 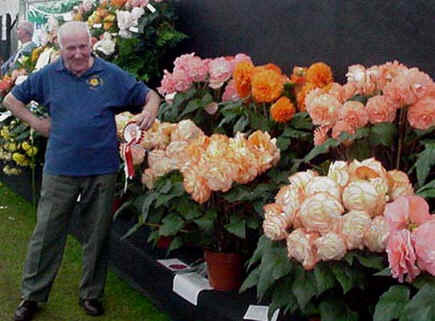 The late Roy Mackey, stalwart Area member pictured at the National Show in 2001. 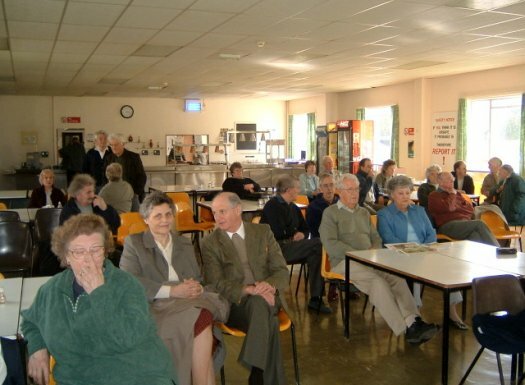 The group meet up at the canteen, Castle Cement, Ketton, Stamford, Linc’s three times a year and also hold a satellite meeting at Sawston , Cambridgeshire. Most years we take a weekend trip over to the continent to visit shows or nurseries. They also have a stand and bureau at the East Anglian Flower Show at Bourn, Camb’s in June. Their area show is held at the Baytree Garden Centre, Spalding on the second weekend in August each year. Baytree Nurseries, Weston, Spalding, Lancs. Sunday 10th. April Spring Meeting. Sunday 22nd. March 2.30pm Spring Meeting. Sunday 18th. October 2.30pm . The Canteen, Castle Cement, Ketton, Stamford, Lincs. Sunday 23rd. March 2.30pm Spring Meeting. Congratulations to Dave Staines on being awarded a Silver Medal Award and also elected Vice Chairman at this years AGM. 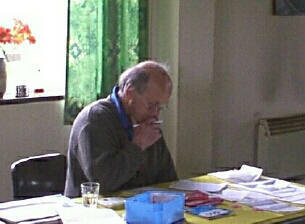 Dave has been our Society's Archivist for many years and is a prominent Area member, exhibitor and hybridiser. 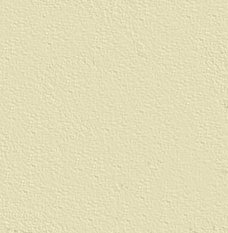 Amongst his introductions the variety "Whispers" is probably the best known. Sunday 27th. March 2.30pm Speaker Dave Staines on hybridising. Baytree Garden Centre, High Road, Weston, Spalding, Lincolnshire. Chapel Field Community Centre, Link Road, Sawston, Cambridge. Sunday 21st. October 2.30pm - Speaker Stan Jenner. Alan Harris auctioneer with helpers. 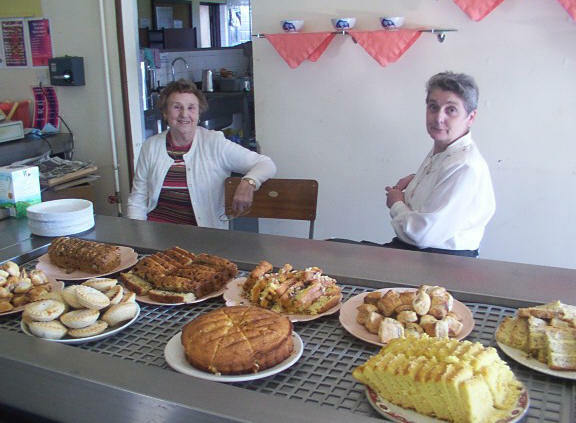 The Annual Plant Sale at the East Anglian Area was held on 15th April 2007 at Ketton Cement Works canteen. This is always the best supported meeting of the year and attracted about 70 members from a large area. There were somewhat fewer plants this year and as a consequence bidding was brisk and most tubers made good prices. This is the area's principal fund raiser of the year and was a huge success." Buyers from far and wide. A warm welcome from the Area Representative. 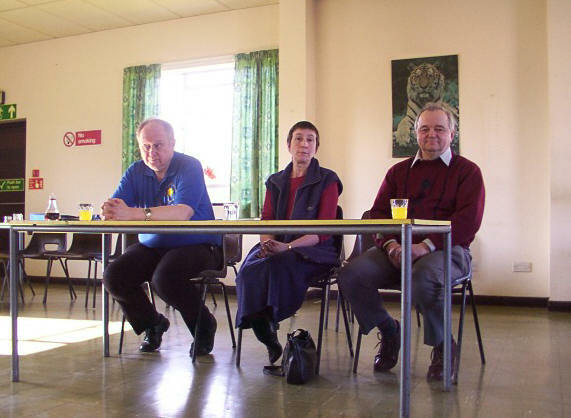 The East Anglian Area Spring Meeting 2007. 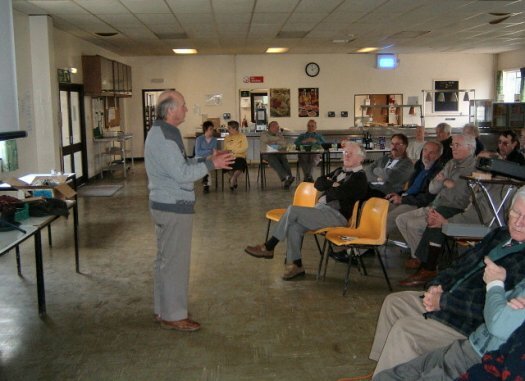 The Area Meeting was held at Ketton Cement works canteen on Sunday 25th March, with about 40 members present. 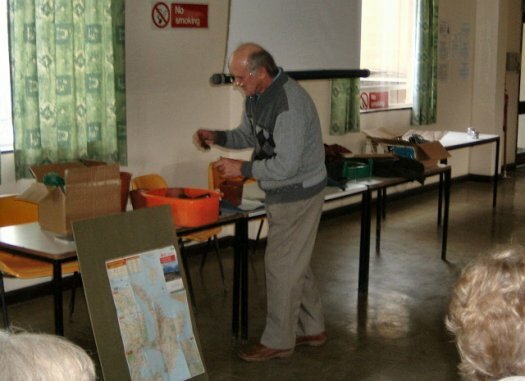 The Meeting opened with John Taylor giving a demonstration on his method of growing cutting tubers using the double pot method from Dave Coates. This was followed by a slide show following John's recent visit to New Zealand. The meeting finished with a question and answer session amongst members and covered many topics including the problem of finding good peat compost. John Taylor demonstrating his cutting tuber growing method. Congratulations to John Taylor who has been awarded the Society's Silver Medal. The award will be presented at The National Show. 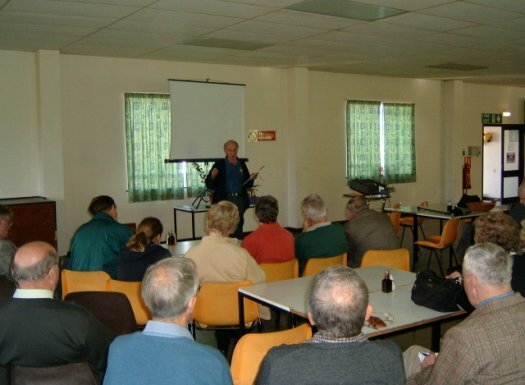 Area Meeting Sunday 24th. July 2005. 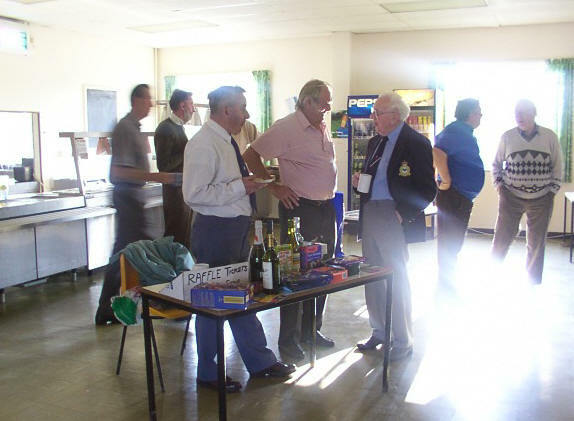 The summer meeting of the East Anglian Group was held on Sunday with about 40 members present. 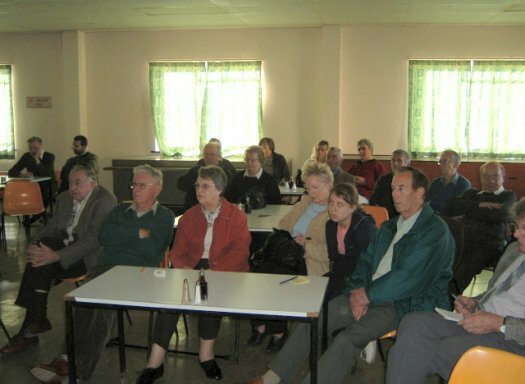 This was a practical meeting held just before the shows to demonstrate preparing plants and the procedure for timing and getting cut blooms to the show undamaged. 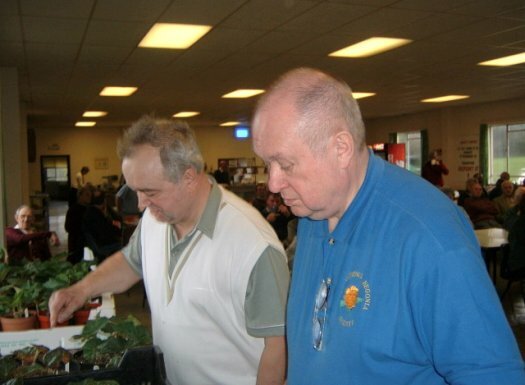 Stan Jenner gave the demonstration on plants and Alan Harris on cut blooms. John Taylor opening the Meeting. 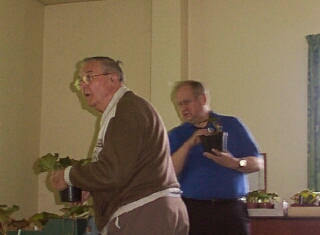 The event is a social event as well as a plant sale. The East Anglian Area Group met at Castle Cement, Ketton, Nr Stamford . 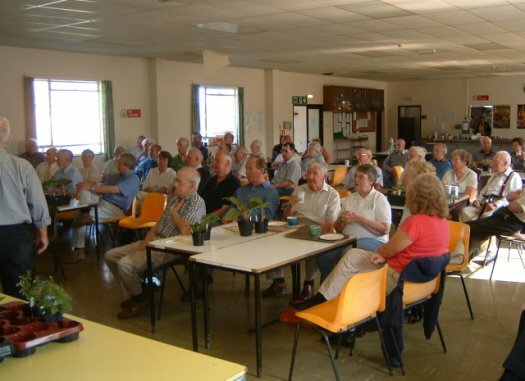 About 45 members had a slide show from John Taylor, which also turned into a question and answer session on the treatment of plants going to rest at this time. The second half of the meeting was a practical talk by Dave Hall on the care of species and rexes as we move into winter. Both were well received and the meeting ended with everyone looking forward to the spring. 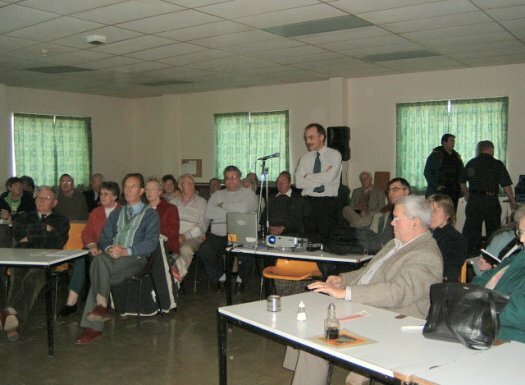 Right : John Taylor opens the Meeting. Below Left : Dave Hall in full swing. Right : The audience are all awake during John Taylor's slide show. Baytree Garden Centre High Road, Weston, Spalding, Lincolnshire. The Area staged a Display at the gardens until July 25th. Plant Sale, Sunday 4th. April 2004. 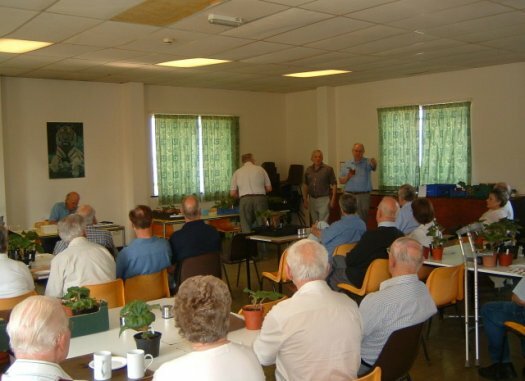 The annual plant sale meeting was held at Ketton with about 70 members coming to sample the bargains. This is always a popular meeting with over 300 plants changing hands. Bidding was keen with over £1000 changing hands. Above, Stan Jenner, left and Alan Harris, auctioneer. Right, Alan opens the auction. 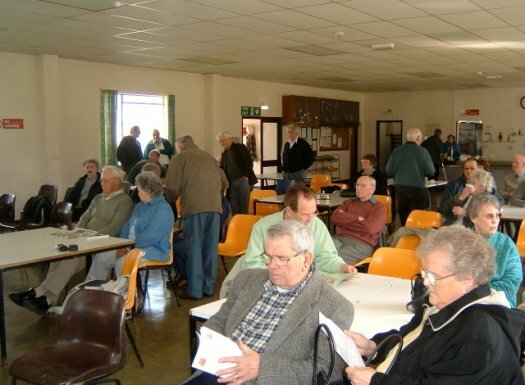 The Autumn meeting of the East Anglian Area was held at Ketton near Peterborough with 64 members turning out on a cold, wet and windy afternoon. We were very pleased that John Hamilton was kind enough to make the long trek (mostly by air) to give a very interesting illustrated talk on how he grows his wonderful begonias. 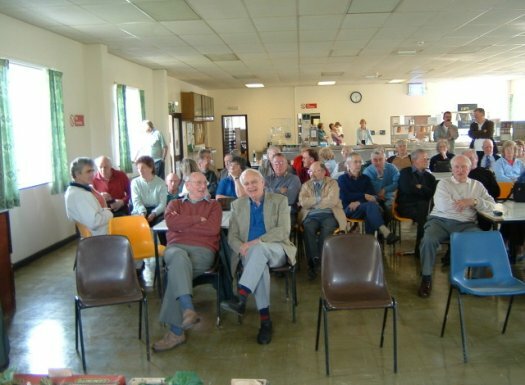 Area Meeting in Sawston, Cambridge Sunday 8th. June 2003. 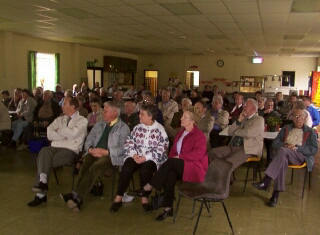 About 30 members attended a talk from Stan Jenner on pot plants and Alan Harris on cut blooms. The meeting was followed by a visit to see how Alan's plants were progressing. Plant Auction Sunday 6th April 2003. 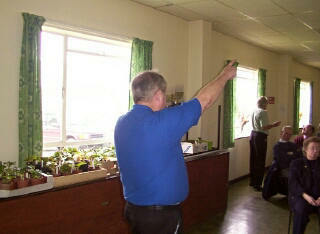 The annual plant auction was again a great success with 72 members attending from all over the country. Our national Secretary Alan Harris acted as Auctioneer and the takings for the day were well over £1’000 making £220 commision for our area funds. The Auctioneers helpers Chris Campbell, Dave Hall and Tony Renolds were kept very busy all afternoon, with the area rep John Taylor keeping the accounts in order. Prices ranged from £1-00 to £12-00 per plant With the privately bred Tubers of Nicola Coates and Whispers making the most money. An enjoyable afternoon was had by all, both venders and buyers and much appreciated was a refreshment break half way through the afternoon. 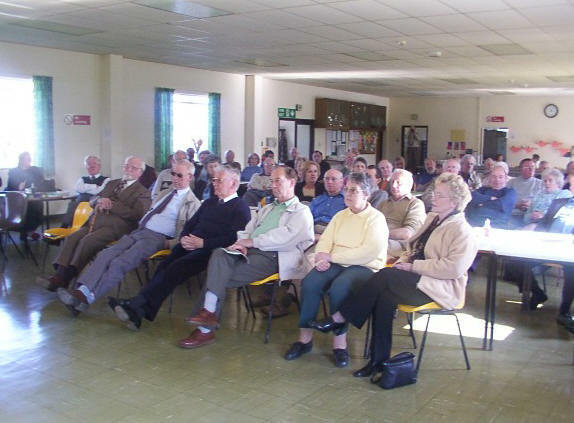 A good meeting was held at the East Anglian Area at Ketton with 71 members attending. 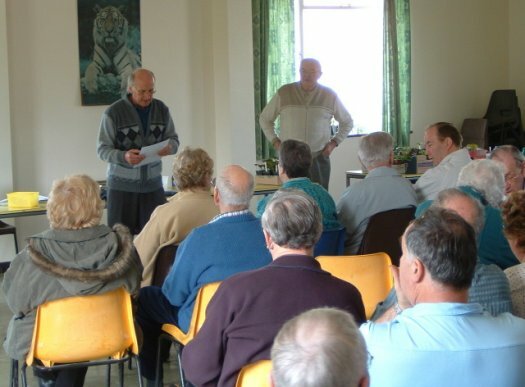 The meeting was in the form of a begonia growers question time with a panel of experienced growers answering questions. On the panel was Alan Harris our National Secretary answering questions on cut blooms, Mag Staines on non tuberous begonias, Stan Jenner on pot plants and John Taylor as a roving chair person taking the questions from the floor. It was a good afternoon with a lot of banter and many members getting involved with a lot of varied questions. All the prizes are donated by members. 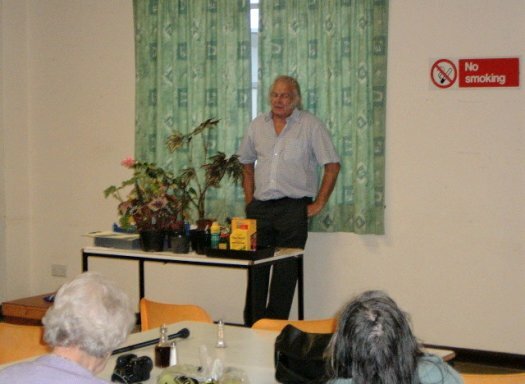 Stan Jenner assisted by myself with a few slides gave a good and amusing talk on his way of growing pot plants . 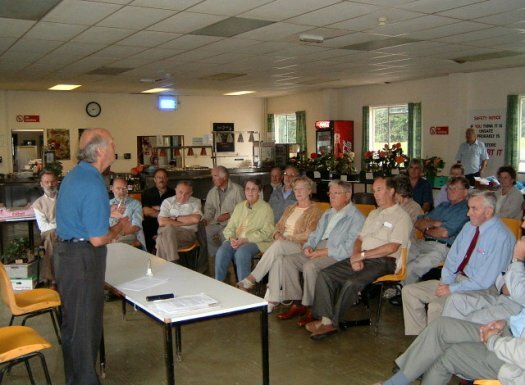 As it was his first time of talking he did very well and it was appreciated by all who attended, about 60 members. His plants this year at our show were some of the best I have ever seen. He won the six pot class and the best pot in show. 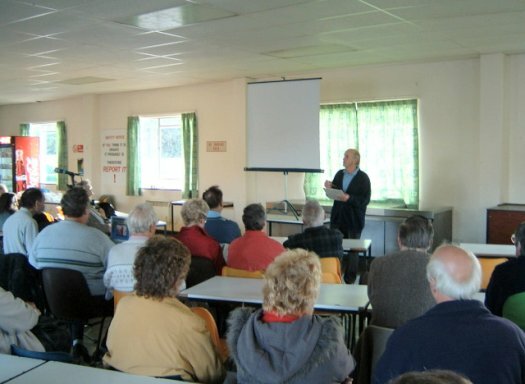 Some of our slides showed how he has improved over the years,I then put on some slides of pot plants so as he could then show our members how they could have been grown and shown better, all in all it was a good meeting.